In 1943, Huntsville Arsenal became Redstone Arsenal. Farming was still a way of life, and no one dreamed at the time our city would soon put men into space. Brooks & Collier's history begins in 1946, when Brooks & Collier Feed & Seed store opened on Brown Street in downtown Huntsville. Huntsville was known as the Watercress Capital of the World and cotton had long been a favorite as well. When Thomas Elbert (T.E.) Brooks and his fiesty business partner, Ernest Collier decided to expand the well-known Purina feed brand into Huntsville, they weren't thinking about German rocket scientists and Apache helicopters. They were building a business selling farmers much needed farming supplies, and feed and seed products. Both old friends and employees of the Madison County Farmer's Cooperative, they had a booming business up into the 1960s, moving into a much larger location on Washington Street. By the time Ernest Collier retired, T.E. 's son Billy Brooks had already started working in the business. When T.E. passed away in 1968, Billy bought total interest in the business. "Because Mr. Collier was such a colorful character and everyone loved him," says current owner Greg Brooks, "Dad left the name the same." As Huntsville grew from a small, farming community to the Space Capital, Brooks & Collier grew with it. In 1987, Brooks & Collier opened their second location (on south Parkway). Greg had just graduated from college in 1987 when his Mom, Doris Brooks, put him immediately to work at the new Brooks & Collier location. "Mom was a slave driver. I grew up in retail working seven days a week. Honestly, she never gave me a day off!" he laughs. The South Parkway store carried comfortable but well-built, affordable outdoor furniture, with a mixture of indoor accessories, while the downtown location continued as a gardening center. "We transitioned into more of a home, garden, and outdoor store," Greg explains. "Up until then, gardening hadn't been a mainstream practice. Suddenly people were buying a single bag of mulch to do their own flower beds; designing their own outdoor spaces; and decorating their patios and poolside with decorative planters, trees, and flowers." Billy and Doris Brooks retired and sold the South Parkway store and in 1993, Kim and Greg bought the older location, which had moved to 813 Meridian Street. The store was barely a shadow of the store it is today. They expanded the nursery and completely renovated the building, enlarging it to provide a huge showroom. During this time, Brooks & Collier began importing furniture from manufacturers all around the world. Then, in 2005, Brooks & Collier leased the store to Summer Classics, when Summer Classics, one of Brooks & Collier's current furniture distributors, were expanding their company stores throughout the southeast. 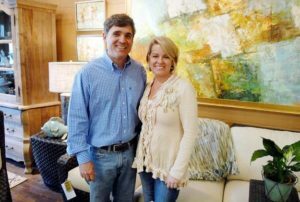 In November 2011, Greg and Kim Brooks took over the lease after seven years and reopened the NEW Brooks & Collier. Since then, Brooks & Collier has grown to become North Alabama's indoor and outdoor living headquarters. We invite you peruse our website to see everything that Brooks & Collier has to offer!